A good chart is a terrible thing to waste, it seems. About a week and a half ago, Speaker Nancy Pelosi's office posted a simple bar graph on her blog, called "The Gavel," showing the progressive decrease in job losses in the United States over the course of the Bush and Obama presidencies. The chart riffed off the January jobs report issued by the Bureau of Labor and Statistics. If you follow online discussions of the economic policy, Pelosi's chart became difficult to avoid. Progressive bloggers used the powerfully simple chart to give weight to arguments that the Recovery Act had, in the year of its existence, had begun to reverse the employment decline of the previous eight years under George W. Bush. One posting by Josh Marshall's Talking Points Memo, for example, was "Dugg" more than 2,300 times. One year ago tomorrow, after tens of thousands of you shared stories and called your representatives, the President signed the American Recovery and Reinvestment Act. And while this anniversary isn't a cause for celebration, there is reason to be optimistic. 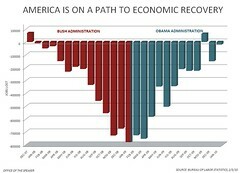 This chart makes it clear: We're on the road to recovery. The Pelosi chart's world tour isn't over, not if Plouffe has anything to do with it. Not content with allowing only the online world to enjoy the graph, Organizing for America is offering up a PDF flyer version of the chart that you can print and take with you. Update: The march of the chart continues. DNC press secretary Hari Sevugan makes it his Twitter icon.